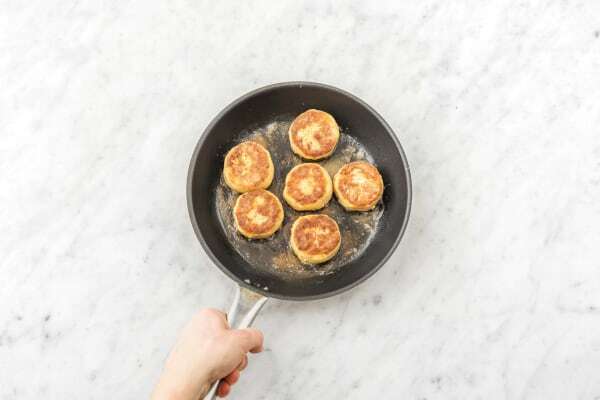 It’s a delicate balance to whip up a salmon cake that is light without falling apart and substantial without being dense. Don’t worry though – we’re going to talk you through it one step at a time. Preheat the oven to 200°C/180°C fan-forced. Thinly slice the sweet potato (unpeeled) into 3 mm discs. Trim the green beans and cut in half. 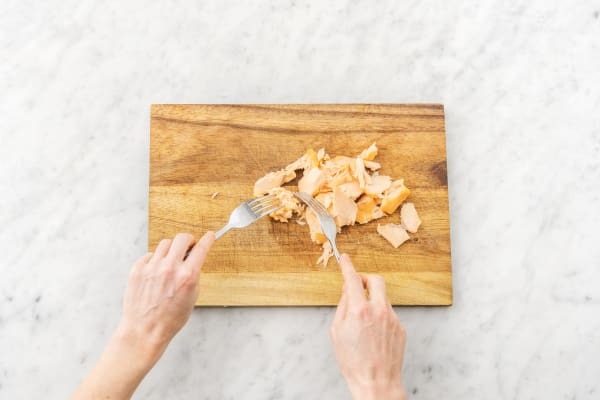 Use two forks to flake the hot smoked salmon deli bites into small pieces. Grate the brown onion (ensure you squeeze out any excess moisture). Place the sweet potato thins in a bowl. Drizzle in a 1/3 of the olive oil and season with pepper. Toss to coat. 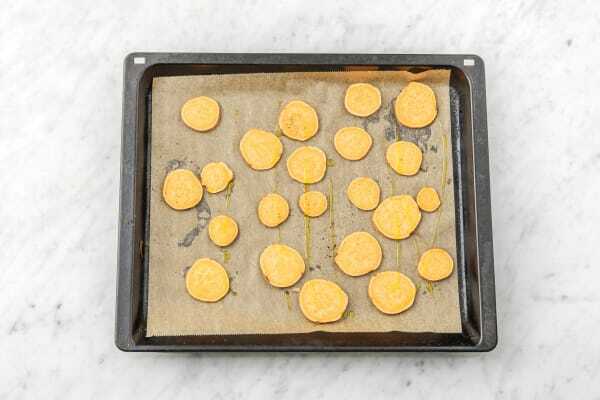 Place the sweet potato thins in a single layer on the prepared oven tray. Place the green beans on top of the sweet potato thins and drizzle with olive oil. Bake for 15-20 minutes, or until the sweet potato is slightly charred around the edges and softened in the centre. Meanwhile, place the flaked hot smoked salmon, grated brown onion, egg and the fine breadcrumbs into a bowl. Season with pepper. Mix to combine. Take a 1/3 cup portion of the mixture and mould into small cakes, about 1 1/2 cm thick (you should get 3 each). Lightly dust in plain flour. Set aside on a plate and transfer to the fridge for 5 minutes to firm up. 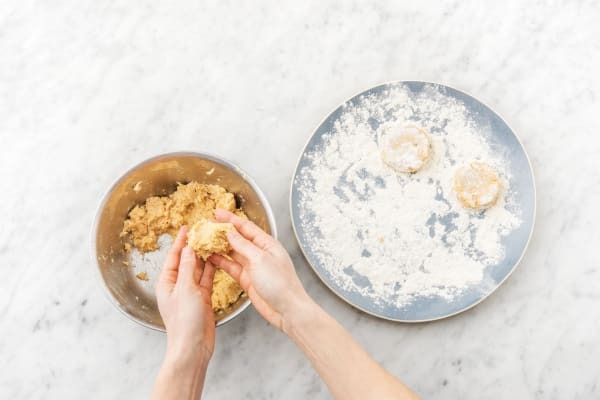 Dusting the salmon cakes in plain flour ensures a nice and golden finish on the outside after frying. 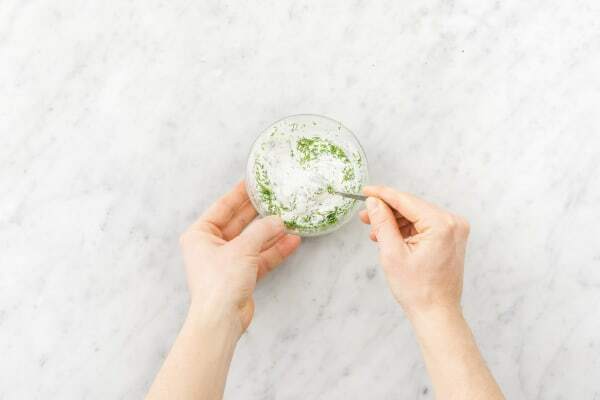 While the salmon cakes are in the fridge, finely chop the dill and combine in a small bowl with the Greek yoghurt. Season to taste with salt and pepper. Set aside. Heat the remaining olive oil in a medium frying pan over a medium-high heat. Cook the salmon cakes for 2-3 minutes on each side, or until golden brown and heated through. Remove from the heat. Drizzle the mixed salad leaves with a dash of olive oil and toss with the baked green beans. 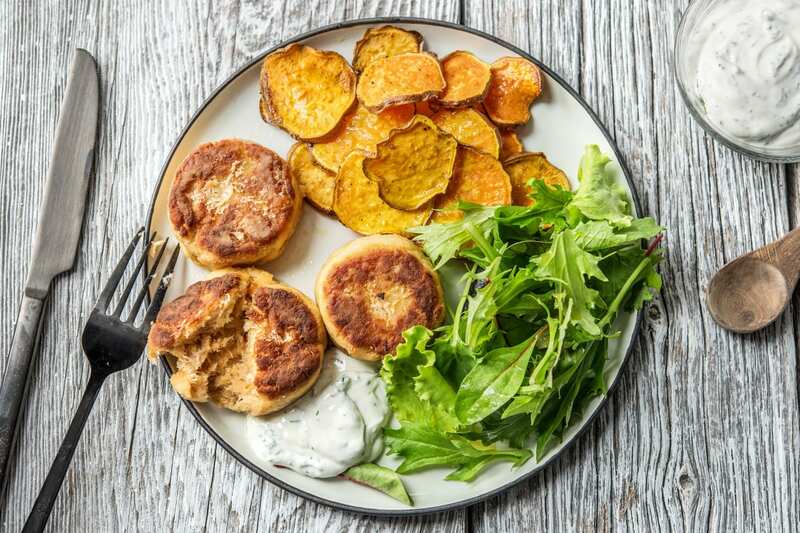 Divide the salad, sweet potato thins and salmon cakes between plates. 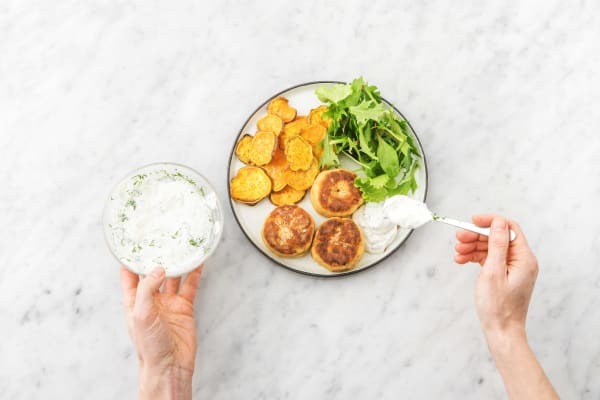 Top with a spoonful of dill yoghurt.